I have a little difficulty when talking about “left” and “right”. I know the difference but somehow I say turn “left”, when really I’m thinking turn “right” – it just comes out wrong. I have the same difficulty with “east” and “west”. Both can cause problems – we end up going the wrong way if D believes me, but he’s known me long enough to ask me do I mean my “left” or his “left”? It was more serious at work, when I described in a newspaper advert the direction of footpath “running in a south-easterly direction” when it should have been “south-westerly” and we had to re-advertise it. Our youngest granddaughter who is nearly 2 years old and a determined little person knows about right and left but thinks they’re the other way round. Just now, she insists on having her shoes on the wrong feet and if you try to suggest that the right shoe goes on her right foot she cries and won’™t have it ‘“ no, no, no. 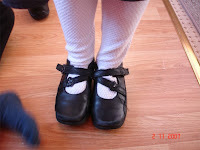 If you manage to get them on the right feet off they come and she puts them on how she likes them. We were taking her brother and sister to school recently and she decided she wanted to wear her Dora wellies even though it wasn’t raining. 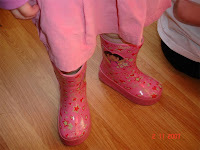 She was adamant about which wellie went on which foot even though we showed her how everyone wore their shoes. 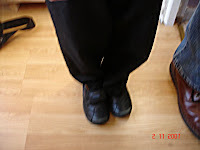 D showed what his shoes looked like on the wrong way round – well nearly – he didn’t take them off. I have just the same problem. I know which way i want to turn (I very, very rarely get lost) but I have to stop and deliberately work out what the direction is called and by the time I’ve worked out left or right, we’ve usually gone past the turning. Now I simply say ‘turn to me’ or ‘turn to you’, which works in most situations. 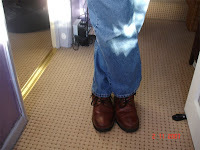 This isn’t going to help with the shoes issue, though! Ann, I’m glad I’m not the only one! Stefanie,she managed to climb up their slide in the garden with shoes (not wellies) on the wrong feet! As I don’t know any older children or adults wearing shoes that way I don’t suppose she’ll carry on doing it – as you say it’s not comfortable. Isn’t that the cutest thing! No conformist there. Oh, and I have no sense of direction, period. kids get the darndest ideas into their heads. :)I just have the sense of direction of a turnip. I can manage up and down, but that’s about it!